It is almost the end of May and this means summer break is here. We do not homeschool year round, although learning never stops. Children are naturally curious and they will learn even if I don’t record it as a school day. We have some summer camps coming up: art, orchestra, app making, manners, soccer, swimming, archery – all these activities involve learning. I have not yet decided if I should count these days toward their next school year. This past school year, I did. But it almost feels like cheating. You know how public school parents chide homeschool parents for not giving their children the “real world?” They are wrong. The real world contains lots of opportunities for being lazy when not under supervision – that happens at home as well as at school; for doing hard things – that happens at home as well as at school; for covering up your mistakes instead of admitting them and learning to make better choices – that happens at home as well as at school. I could go on and on. Back to my topic: another school year is behind us. 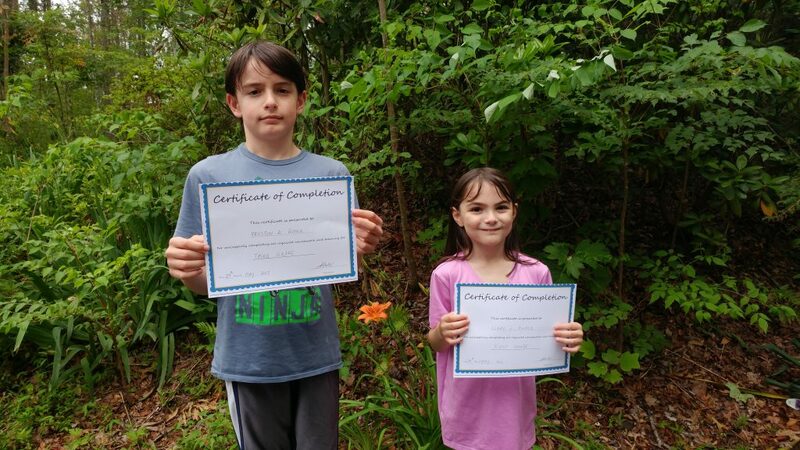 I printed out a certificate of completion for each child, filled out their grade and name, the date, my signature, and I snapped the picture above. Each child has a cumulative file at our umbrella school and also one at home. Every year, the certificates end up there, alongside their curriculum list and attendance record. The kids have grown in every sense of the word. I have grown a few more gray hairs. I don’t want to say that I have grown and developed more patience, for instance, because as soon as I say that something happens and wham! I lose my temper – proof positive that it is time to eat humble pie. I have relaxed a bit though, I am thankful for that. I am my own worst critic and can be very hard on myself. Going through a few natural disasters has loosened me, I suppose. Here’s to a great summer break! I will keep blogging through the summer about our various activities.